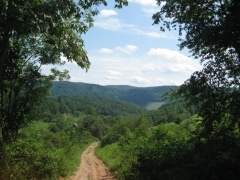 5.7 acres located only a few minutes from the town of Tazewell TN. This property is also close to Norris Lake. The land is mostly hillside with a small leveled area that would be perfect for an RV or mobile home or cabin. There is a spring on this property and electric at the road. This property is priced lower than others because there is debris that needs to be cleaned up (building material, tires, old appliances... etc). There is also an old shack that needs to be torn down. This is a great opportunity to acquire a "fixer upper" tract at a low price that could be really nice with some work.